Cork City will need to defy all the odds to stretch their Europa League journey into the play-off stage as they head to Rosenborg for the second leg of their third qualifying round clash tonight. The Norwegians came away from Turner's Cross with a 2-0 victory last week that leaves them in total control of the tie. They'll run out at the Lerkendal Stadium expecting - and expected to - finish the job on their own patch. Impressive Swedish midfielder Jonathan Levi bagged both goals on Leeside and though Rosenborg were held to a 1-1 draw against third-from-bottom Stabaek in the league on Sunday, they were very unlucky not to beat Celtic in their Champions League third-round second-leg clash, a game which showed how technically good they can be. Sligo Rovers did turn over Rosenborg at the Lerkendal in this competition back in 2014, when goals from Alan Keane and Danny North gave them a brilliant 2-1 win, though a 3-1 defeat in the return leg ultimately burst their bubble. 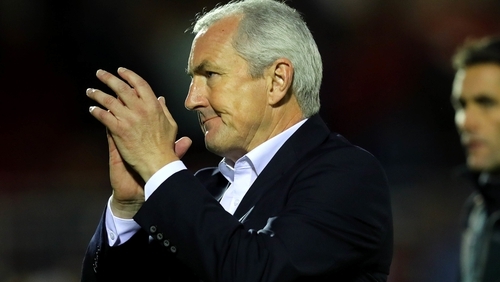 John Caulfield does believe Cork can pull this off however, and said his charges have been working extensively on exploiting chinks in the home armour to get that crucial first goal and make Rosenborg nervous. "We know it's going to be difficult," he told RTÉ Sport's Tony O'Donoghue. "If we can score out here it's game on. We know it's going to be difficult but we've done a lot of work on it and we feel we can create the chance and hopefully take the chance to open the game up. "It's not about us having to score in the first 15 or 20 minutes but certainly we have to score. If we can do that. it unsettles people." Rosenborg interim manager Rini Coolen is taking nothing for granted, insisting his men will take Cork "very, very seriously". They are second in the league, a point behind Brann, and were in crisis only a month ago when the sacking of boss Kare Ingebrigtsen sparked a player revolt. Coolen has steadied the ship since, and remains coy over his ling-term future. "I think they did a great job at home against us, put us under a lot of pressure going for attacking moments," he said. "At the same time they gave some space away and we have to use that space a bit better than we did. We expect a team that wants to fight and go for a result. It's up to us to manage that and create more chances for ourselves and score some goals. "I'm enjoying it every day to be on the park with the players and the staff. My job is until the end of the season. "If that's going to be changed, to keep me in the role for a longer time, of course we can talk about it, but how it is now is very simple and very clear: I'm here until the end of the season, and then I go back to my role as the academy director."